Welcome to North Lawrence Antiques in North Lawrence, Ohio. 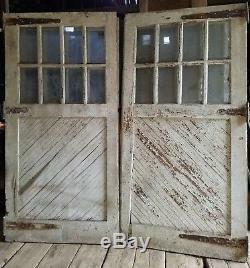 Offered here is an original set of 2 antique carriage doors with original old painted surfaces. Great old paint and the angled slats in the lower panel really gives it a special look. Together they measure 96 inches wide by 96 inches high and they are 1-3/4 inch thick. Has normal surface wear consistent with age and use including chips, scratches, rust, and paint wear. 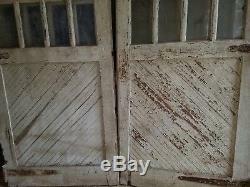 The wood panel on one of the doors has a portion of one slat missing. On the back of the other door there are a couple of added boards nailed on. One glass pane has a crack but is stable. I have a good shipper close to me that will do local or long distance reasonably. If we can help with any arrangements please call with questions at 330-844 2840. 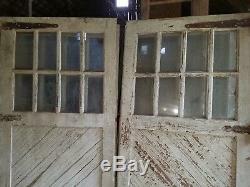 The item "Antique Carriage Door set measure 96 x 96 overall vtg. 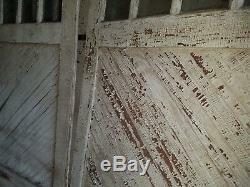 Barn, garage old paint" is in sale since Wednesday, July 4, 2018. This item is in the category "Antiques\Architectural & Garden\Doors". The seller is "possumtoe" and is located in Massillon, Ohio. This item can't be shipped, the buyer must pick up the item.